The Research Institute for Humanity and Nature (RIHN) was established in pril 2001 to conduct integrated research in the field of global environmental studies. 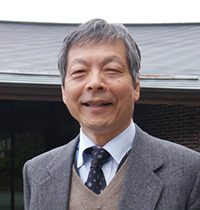 In 2004, RIHN became one of the original members of the National Institutes for the Humanities (NIHU), an Inter-University Research Institute Corporation. Environmental degradation can be understood as an imbalance in interactions between human beings and natural systems. Our mission is, therefore, to conduct solution-oriented research aimed at exploring how these interactions between humanity and nature ought to be. To achieve this mission, RIHN has been conducting interdisciplinary research spanning the natural sciences, humanities, and social sciences, and in recent years, has developed towards transdisciplinary research that involves collaboration with various takeholders in society. Since its establishment, RIHN researchers have formulated creative projects to address social needs in diverse fields of environmental interaction. Following an external review of research activities and organizational structures, in fiscal year 2015 we reformed the ways in which we conduct and promote research projects in order to enhance coordination and integration of the projects for achieving the goals of the RIHN mission. As part of this reform, in April of 2016 (beginning of fiscal year 2016), we launched a new research initiative to achieve “Transformation Towards Sustainable Futures in Complex Human-Nature Systems in Asia.” For this purpose, we started a set of Research Programs, a Core Program, and the RIHN Center. With a new structure in place, we are now pursuing our initiative through enhanced collaboration within our institute, across the diverse research community, and with society in general. To enhance international activities of RIHN, we are also collaborating with the international research platform Future Earth, which aims to integrate global environmental change research for achieving global sustainability. In fiscal year 2018 we are fully implementing these new research initiatives. For several decades, researchers have attempted to find solutions to the environmental problems that now confront human communities at all scales, but despite extensive research in individual disciplines, many environmental problems have remained unresolved. There is therefore a need to go beyond partial descriptions of discrete environmental problems towards holistic understandings of the underlying causes of these problems and for integrated approaches to their solutions. The Research Institute for Humanity and Nature is a national research institute established by the Government of Japan in 2001 and it is part of the National Institutes for the Humanities. RIHN research starts from the premise that environmental problems are rooted in human society, culture, and values. The goal of RIHN is to seek concepts, theories and mechanisms capable of describing and enabling transformation of human-environment interactions. This implies that RIHN research involves a normative dimension, driven by questions such as what the relationship between humanity and nature ought to be like. To this end, RIHN solicits, funds, and hosts integrative research projects investigating environmental change problems in specific settings. Research projects are undertaken by interdisciplinary teams at RIHN, partner institutions, and societal stakeholders in Japan and abroad. We at RIHN believe that research ought to contribute to the search for solutions to real-world problems and, therefore, we promote a co-design and co-production approach where researchers and societal actors join hands in exploring problems and developing new framings and possible solutions. RIHN research is increasingly transdisciplinary in that it seeks to redefine the role of science in society, improve dialogue between different traditions of knowledge, and stimulate new multi-actor local, national and international collaborations. This approach needs to draw on multiple, diverse perspectives from a range of disciplines including the natural and social sciences, arts and humanities, and engineering and design. Science cannot be uniformly applied to the world but should instead enable solutions to social-environmental problems that are informed by lived social practices and communal values. RIHN research is developed globally, but with Asia as a core focus area. Not only is Asia’s impact on global development increasingly conspicuous, but at the same time it is also home to many examples of long-term cultural-ecological continuity that need to be understood in terms of their own significance to regional dynamics. RIHN research crucially depends on long-established networks in Asia and contributes to transdisciplinary initiatives in the region, among others by hosting the Regional Centre for Future Earth in Asia. Contribution to problem-solving by applying research results in support of, and participation in, on-site multi-stakeholder arrangements in society. RIHN is fundamentally a project-based institute, with projects alternating through a 5-7-year cycle. Identification of ideas for projects happens through public solicitation. Through a process of evaluation and selection that includes “incubation” and “feasibility” stages, these ideas are gradually developed into fully-fledged projects and only get officially underway after evaluation by an international external review committee. At this point, the proponent becomes joins the RIHN community by becoming a staff member of the Institute. In most cases projects run for five years. They include a core team of researchers based at RIHN and a much larger network of partners at research institutions throughout Japan and abroad. RIHN research is organized into Programs and Projects rather than preexisting academic disciplines or domains. Three Research Programs and one Core Program are each home to multiple projects that carry out research in line with the Program’s broad direction. The bundling and integration of Projects within the Programs facilitates synthesis of research results and allows for strategic planning of research. Programs are subject to annual review by the External Research-Evaluation Committee (see RIHN Project Trajectory on pages 7 & 8). RIHN endeavors to improve its research by making good use of the review results while also respecting the independence of each Program. Research Programs are organized around three themes identified in the Phase III Medium-Term Plan. In addressing environmental problems, technological and institutional developments are important, but RIHN recognizes that these need to build on the foundation of people’s awareness, value systems and culture. The programs collaborate closely with society in developing and proposing options that contribute to the transition of society. This program aims at providing realistic perspectives and options to facilitate the transition to a society that can flexibly respond to environmental changes caused by human activities such as global warming and air pollution, as well as to natural disasters. Taking tradeoffs into account, this program provides multifaceted options to stakeholders involved in production, distribution, and consumption of resources, in order to realize fair use, optimal management, and wise governance of diverse natural resources including energy, water and ecological resources. Our “lifeworlds” are composed of the physical spaces and socio-cultural spheres of our everyday lives. They are continually reproduced, reimagined, and evolving through an interactive and reflexive relationship with society, culture, and nature. Program 3 proposes research aimed at illuminating reciprocal linkages between diverse rural and urban lifeworlds and contributing to the solution of sustainability problems by working with various societal partners such as governments, companies, and citizen groups. Special emphasis is placed on envisioning sustainable futures that improve wellbeing and gauging their feasibility. Incubation Studies (IS) are proposed by individual researchers to the RIHN Project Review Task Committee. If approved, the researcher is granted seed money to prepare a proposal for Feasibility Study. Feasibility Studies (FS) allow the study leader a period to develop a proposal for Full Research. In the transitional Pre-Research (PR) period, the project leader formally assembles the team, establishes MOUs necessary for collaboration with other institutions and makes other preparations to enable Full Research. Full Research (FR) lasts from three to five years. It typically involves a research team at RIHN and concurrent activity with collaborators overseas, several periods of field study, workshops and presentations, and outreach or communication to relevant communities. FR projects are evaluated by the External Research Evaluation Committee at the beginning (selection) , mid-term and the end (final evaluation). Based on the mission of RIHN and in order to realize the strategies and policies formulated by the Council for Research Strategy, the Core Program undertakes research on an ongoing basis. During Phase Ⅳ, the Core Program will develop concepts and methodologies to solve global environmental problems in collaboration with society. The RIHN Center provides the foundations for collaborative research and activities at RIHN. Its four Divisions manage and operate the laboratories and the information systems of the Institute, and facilitate communication, networking and capacity building (see detailed description on page 42.). Center faculty also engage in research in pursuing the goals of the Center. Collaboration is fundamental to the operation of the RIHN Center: it works closely with the Core Program and Research Programs by providing tools, facilities and methods. It also collaborates with the wider academic community in support of RIHN’s role as a joint-use Inter-University Research Institute and engages a broad range of societal stakeholders in problem-solving research processes. Research rooms on the RIHN campus are designed to provide a sense of openness. The design concept is to allow implemented projects to be loosely interconnected as they occur in one large curved space 150 meters in length. The facilities help external researchers as well as RIHN research staff to meet one another, since they are designed with the maximization of shared use in mind. At the center of the main building, a library and computer room are located for the convenience of many users, and three common rooms are provided for casual discussions. 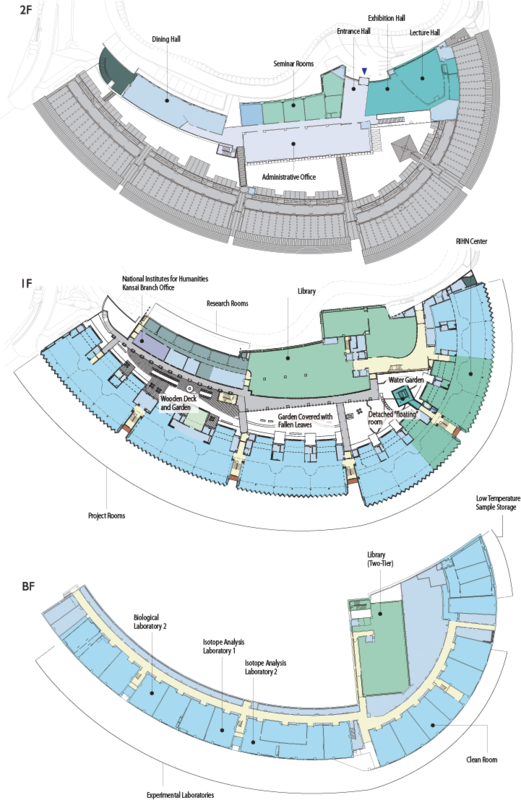 On the basement floor, a cluster of fully functional laboratories has been designed with emphasis on convenience for shared use, as with the research rooms. The separate RIHN House is a guesthouse. The assembly hall and a dining lounge located to the left of the house entrance serve as meeting spaces for the RIHN staff as well as for guests. 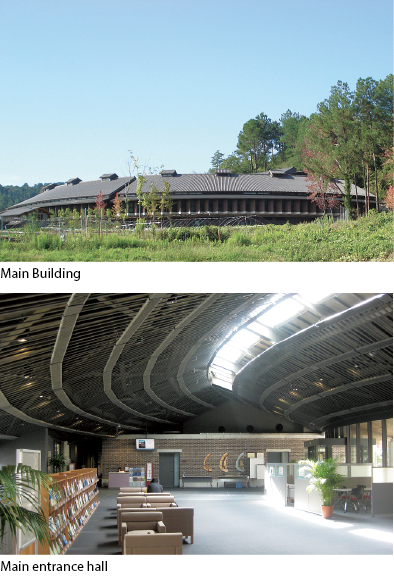 Appropriately for an institution researching the global environment, RIHN is housed in a tile-roofed building suited to the Kyoto landscape, where as many as possible of the trees already on the site have been retained. Lighting and air-conditioning also employ the latest designs to minimize the building's impact on the environment. The design has won acclaim, receiving awards from the Illumination Engineering Institute of Japan, the Japan Institute of Architects, the Green Building Award from MIPIM Asia, and the Architectural Institute of Japan. RIHN researchers work across the breadth of global environmental studies. If the diverse knowledge they produce is the warp, then the unifying weft is provided by field measurement, laboratory analysis, data and information management, and academic and social communication of research progress and results. In maintaining and supporting RIHN research capacity to collect and analyze data and to communicate research in numerous professional and public fora, the RIHN Center enhances our collaborative research around the world and contributes the kind of integrated knowledge that can solve global environmental problems. RIHN research projects are multidisciplinary and multimethod; in common they share the need for high quality physical observation and chemical and biological analysis of the surface environments of the earth. 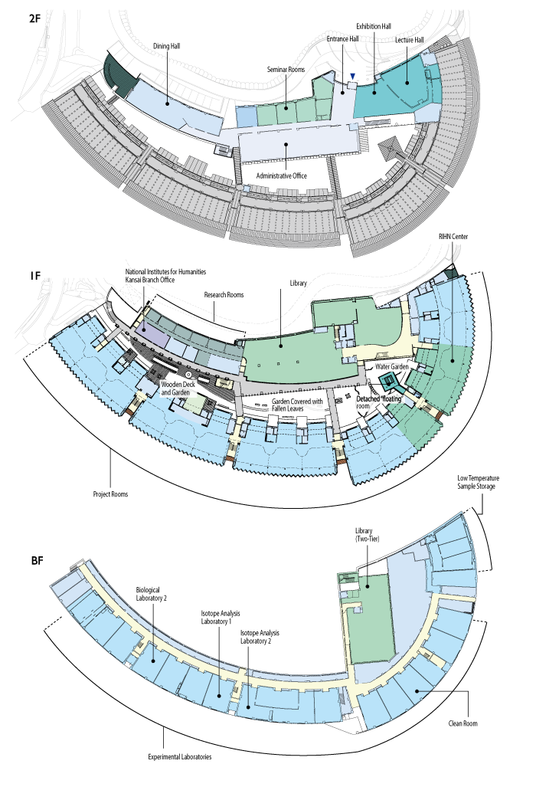 As a national institute, RIHN houses eighteen basement laboratories designed to address this need. There are state-of-the-art laboratories dedicated to microscopic, DNA and stable isotope analysis. 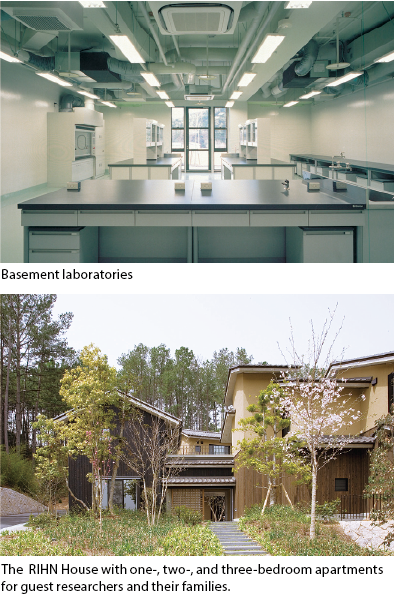 Additional facilities include two fieldwork preparation rooms for storage and maintenance of observational and sampling equipment, three low-temperature rooms for organism and ice core storage, three incubator rooms for storage of organisms requiring specific temperatures, and a clean room in which samples can be processed in a contamination-free environment. RIHN research projects conduct a variety of studies around the world and collect a diverse range of samples that contain valuable information that will help illuminate human-nature interactions. Stable isotope and DNA data in particular can give very precise descriptions of how materials and species interact, change, and move through time and space. In addition to maintaining state-of-the-art laboratories, the Laboratory and Analysis Division of the RIHN Center continues to develop new methods of data analysis and application. 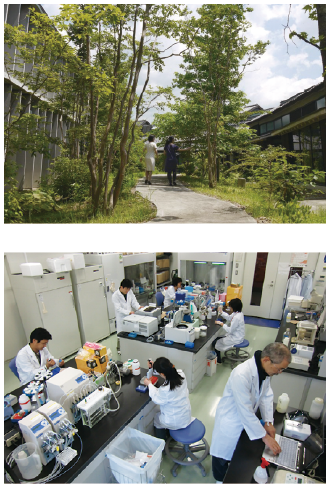 In conducting this research in collaboration with RIHN projects, universities and affiliated institutions throughout Japan, the division enhances the sophistication of experimental techniques and exchange of research information, and promotes the shared use of facilities.